What are the different types of colorblindness? 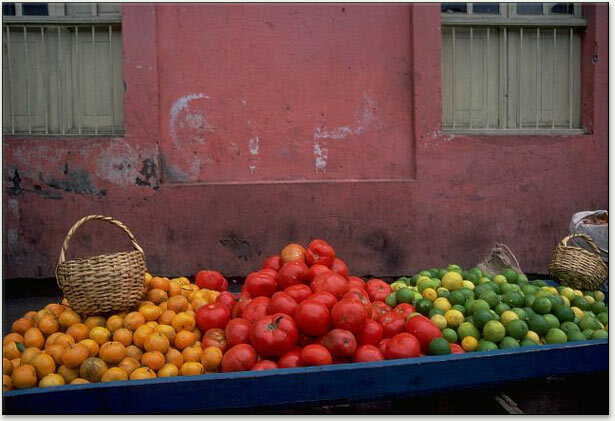 Could you tell the difference between a tomato, a lime, and an orange? Some colorblind people (protanopes and deutanopes) see no perceptible difference between red, orange, yellow, and green. Colors that seem so different to the average viewer appear to be the same color for this two percent of the population. Hundreds of millions of people have vision problems. Colorblindness affects as many as 1 in 12 men and 1 in 200 women. Although colorblindness is typically the result of a genetic condition, acquired color deficiencies can stem from injury or disease. While not officially labeled colorblindness, as people age, their corneas typically turn yellowish, severely hampering their ability to see violet and blue colors. Cataracts are another major vision problem affecting a large proportion of the population. When a person has a cataract, the lens in his or her eye is no longer entirely transparent. Because aging is the most common risk factor for the condition, increased life expectancy has made cataracts the leading cause of blindness worldwide. In the U.S., over 20 million people 40 years of age and older experience this clouding in the lens of the eye, and cataracts are estimated to be the cause of half of the cases of vision loss in white, African American, and Latino people. The different forms of colorblindness can be classified according to the affected cone type and the degree of deficiency. People with typical cones and light-sensitive pigments are able to see different colors by using three types of cone pigments (referred to as L for long wavelengths, M for medium wavelengths and S for short wavelengths) having different spectral sensitivity. This is called trichromacy. Sometimes vision is based on only two types of cone pigments. This is known as dichromacy. A mild color deficiency is present when one or more of the three light sensitive pigments in the cones are atypical and their peak sensitivity is shifted (anomalous trichromacy). This can vary from being very mild to almost as severe as dichromacy. Total colorblindness is very rare but the effects are severe. L-cone, M-cone, or S-cone monochromacy describes a condition where only one type of cone pigment functions, and thus only a single color is perceived. In rod monochromacy or achromatopsia, there are no working cone pigments in the cones. Achromatopsia can be inherited or cerebral achromatopsia can develop. The terms protan, deutan, and tritan are used to refer to the absence of functional L-cone, M-cone, and S-cone pigments, respectively. Protanopes (L-cone) and deutanopes (M-cone) are often referred to as red-green colorblind and tritanopes (S-cone) are often referred to as blue-yellow colorblind. This can be misleading, as tritanopes can distinguish between blue and yellow.